A brand new museum has opened on Sesame Street, the Museum of Modern Cookie! Cookie Monster, Elmo, and Chris are very excited to check it out. However, when they step inside, all of the cookie art starts to make Cookie Monster hungry for cookies. Chris explains that he needs to control himself and use only his eyes to look at the paintings. Prairie Dawn welcomes them to the museum and gives them a tour. As they walk through the museum, Cookie Monster stops and sees the famous Muncha Lisa by Leonardo da Crunchy and learns how it was created. 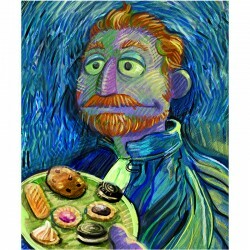 They also learn about The Cookie Eaters by Vincent Van Dough and The Cream by Edvard Munch. Suddenly, the paintings begin to disappear, and the museum guards think Cookie Monster has stolen them. Elmo knows Cookie Monster didn’t steal the paintings so he becomes a detective and looks for clues to find out who really took the art. He finds crumbs, butter, and chocolate chips, and they realize that the thief must be a cookie. But the guards do not believe them and throw them out of the museum. As Chris, Elmo, and Cookie Monster are walking home, Abby appears. They tell her what happened and she comes up with a plan – she’ll use magic to turn them into a painting and then deliver them to the museum. Abby hangs them on a wall and hides. The cookie thief appears and takes the painting. Cookie Monster, Elmo and Chris call Abby for help and she changes them back. Along with the guards, they chase the thief to find the stolen art. The cookie thief admits to stealing the paintings; he just loves cookie art. Cookie Monster explains that he understands how the cookie feels but that he can’t take the cookie art because then no one else would be able to enjoy it. Cookie Monster then comes up with an idea– the cookie can make his own art! With paint and paper, the cookie makes a self-portrait and the guards hang it up on the museum wall, the perfect spot. Watch this special #chewdunnit on WSKG TV | Monday, May 29, 2017 at 10:30am!